Askari, Y., Kafash Saei, E., Delpasand, S., Rezaei, D. (2013). Evaluation of Crategus sp. spatial pattern in the Central Zagros Forest. International Journal of Advanced Biological and Biomedical Research, 1(2), 179-185. Yousef Askari; Elmira Kafash Saei; Sehar Delpasand; Dorna Rezaei. "Evaluation of Crategus sp. spatial pattern in the Central Zagros Forest". International Journal of Advanced Biological and Biomedical Research, 1, 2, 2013, 179-185. Askari, Y., Kafash Saei, E., Delpasand, S., Rezaei, D. (2013). 'Evaluation of Crategus sp. spatial pattern in the Central Zagros Forest', International Journal of Advanced Biological and Biomedical Research, 1(2), pp. 179-185. Askari, Y., Kafash Saei, E., Delpasand, S., Rezaei, D. Evaluation of Crategus sp. spatial pattern in the Central Zagros Forest. International Journal of Advanced Biological and Biomedical Research, 2013; 1(2): 179-185. Spatial pattern of trees can possibly indicate stand history, population dynamics, and species competition. This research was investigated in the Chahartagh forest reserve, Ardal region, chaharmehal and Bakhtiari Province, Central Zagros forest, and southwest Iranian state. In this study 53 hectare of the study area was selected and perfect inventory. Information includes the position and kind of tree, height and two diameters of crown were recorded. To study of spatial pattern used the quadrat sampling methods. Inventory method designed in the base of systematic-randomize methods by use the nearest individual, and inventory accrued in the five treatment and measured 5×32 (total 160) sample (measured the nearest individual). To analysis of spatial pattern used the distance method and Johnson & Zimmer and Pielou indexes. Data analyzing was done by Ecological Methodological software’s. all applied indicators showed a clumped pattern for Crataegus sp chahartagh forest reserve in Central Zagros region, and Western Iranian state of Iran. Batista. J. L. F., Maguire. D. A. (1998). Modeling the spatial structure of tropical forests. Forest Ecol. and Manag, 110: 293-314. Basiri. R., (2006). Investigation of tree spatial pattern of Ghamishle (Kurdistan province) forest. Journal of the Iranian Natural Res, 59(2): 577-588. Bazyar. M., Haidari. M., Shabanian. N., Haidari. R.H. (2013b). Impact of physiographical factors on the plant species diversity in the Northern Zagros Forest (Case study, Kurdistan Province, Marivan region). Annals of Biological Research, 4 (1):317-324. Condit. R., Ashton. P. S., Baker. P., Bunyavejchewin. S., Gunatilleke. S., Gunatilleke. N., Hubbell. S. P., Foster. R. B., Itoh. A., LaFrankie. J. V. (2000). Spatial patterns in the distribution of tropical tree species. Science, 288: 1414-1418. Dastmalchi. M. (1998). Investigation compatibility experimental of tree species Ardabil province. Jangal and Senoubar J. Inst, For, Ranglands Res, 203: 168. Erfanifard. Y., Feghhi. J., Zobeiri. M., Namiranian. M. (2008). Investigation on the Spatial Pattern of Trees in Zagros Forests. Journal of the Iranian Natural Res, 60(4): 1319-1328. Ludwig. J. A., Reynolds. J. F. (1988). Statistical ecology, USA: John Wiley & Sons. Erfanifard. Y., Feghhi. J., Zobeiri. M., Namiranian. M. (2009). Spatial pattern analysis in Persian oak (Quercus brantii var. persica) forests on B&W aerial photographs. Environ Monit Assess, 150: 251–259. Fattahi. M. (1994) Study on Zagros oak forests and the most important their destruction causes. Institute of Forests and Rangelands Research press, Sanandaj, Iran. Haase. P. (1995). Spatial pattern-analysis in ecology based on ripley k-function: introduction and methods of edge correction. J. Veg. Sci, 6: 575-582. Habashi. H., Hosseini. S.M., Mohammadi. J., Rahmani. R. (2007). Stand structure and spatial pattern of trees in mixed Hyrcanian Beech forests of Iran. Iranian Journal of Forest and Poplar Research, 15(1): 55-64. Haidari. M., Jalilvand. H., Haidari. R.H., Shabanian. N., (2012 a). Study of Plant Biodiversity in Grazed and Non-grazed Areas in the Iran-o-Turanian Ecological Zones (Case Study: Yazd Province, IRAN). Annals of Biological Research, 3 (11):5019-5027. Haidari. M., Etemad. V and Khosropour. E. (2013b). Study of tree regeneration in the grazed and non-grazed areas in the Iran-o- Turanian Ecological Zones. 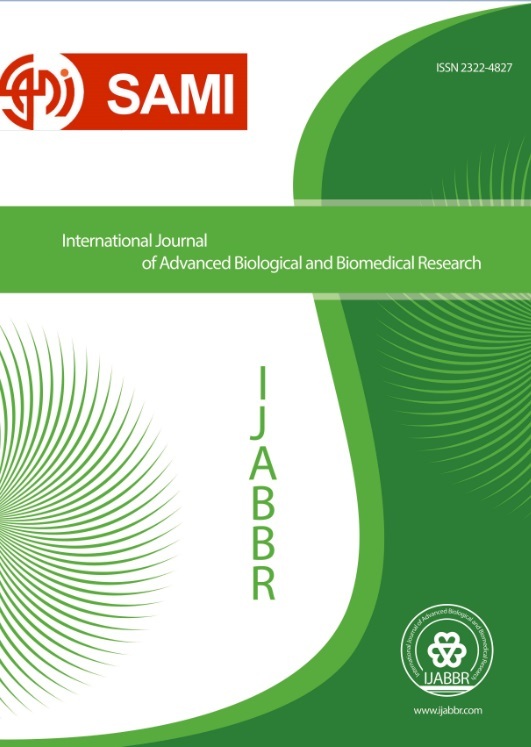 International journal of Advanced Biological and Biomedical Research (IJABBR), 1(1): 18-24. Haidari. M., Rezaei. D., (2013c). Study of plant diversity in the Northern Zagros forest (Case study: Marivan region). International journal of Advanced Biological and Biomedical Research, 1(1): 1-10. Haidari. M., Namiranian. M., Zobeiri. M and Ghahramany. L. (2013d). Evaluation of different sampling method to study of tree density (tree/hectare) in the Zagros forest. International journal of Advanced Biological and Biomedical Research, 1(1): 11-17. Haidari. M. (2013e). Study of herb diversity in the zagros forest (Case study: Kurdistan province). International journal of Advanced Biological and Biomedical Research, 1(1): 25-34. Haidrai. M., Bazyar. M., Hosseini. S.A., Haidari. R.H., Shabanian. N. (2013f), Study of forest destruction by used the diversity index in the Northern Zagros Forest (Case study: Oak forest). International Journal of Biological & Medical Research, 4(1): 2720- 2725. Hassani. M., Amani. M. (2010). Investigation on structure of oriental beech (Fagus orientalis Lipsky) stand at optimal stage in Sangdeh forest. Iranian Journal of Forest and Poplar Research, 18:163-176. Jahanbazi gojani. H., Ahmadi Karori. S., Talebi. M. (1998). Researches planning of natural resource, Iran, 87p. Kint. V., D. W. Robert., L. Noel. (2004). Evaluation of sampling methods for the estimation of structural indices in forest stands. Ecological Modelling, 180: 461–476. Marvi-Mohajer. MM. (2005). Silviculture. Tehran University Press, Tehran, 380p. Mitchell. A. (2005). The ESRI Guide to GIS Analysis.Vol. 2, ESRI Press. USA. Parma. R., Shataee. S. (2013). Estimation of species diversity of trees and shrubs using ETM+ sensor data (Case study of forests in Qalajeh Kermanshah province). International journal of Advanced Biological and Biomedical Research, 1(1): 71-78. Nelson. T., Niemann. K. O., M. A. Wulder. (2002). Spatial statistical techniques for aggregating point objects extracted from high spatial resolution remotely sensed imagery. Geographic Systems, 4: 423–433. Safari. A., Shabanian. N., Heidari. R.H., Erfanifard. S.Y and M. Pourreza. (2011). Spatial pattern of Manna Oak trees (Quercus brantii Lindl.) in Bayangan forests of Kermanshah. Iranian Journal of Forest and Poplar Research, 18 (4): 596-608. Safari .A., Shabanian. N., Heidari. R.H., Erfanifard. S.Y., Pourreza. M. (2011). Investigation of spatial pattern of wild pistachio (Pistacia atlantica Desf.) (case study: Bayangan forests, Kirmanshah). Iranian Journal of Forest, 2(2): 177-185. Shimatani. K., Y. Kubota, (2004). Spatial analysis for continuously changing point patterns along a gradient and its application to an Abies sachalinensis population. Ecological Modelling, 180: 359–369. Pielou. E.C. (1969). An introduction to mathematical ecology. Wiley-Interscience, New York, viii, 286 p.
Zabiholahii. S., Haidari. M., Namiranian. N., Shabanian. N. (2012). Effect of traditional forest management practices in Havare khol pattern on forest structure (Case study: Kurdistan province, Northern Zagros forest). IOSR Journal of Pharmacy and Biological Sciences (IOSR-JPBS), 5(1): 42-47. Wolf. A. (2005). Fifty year record of change in tree spatial patterns within a mixed deciduous forest. Forest Ecology and Management, 215: 212–223. Wong. D. W. S., J. Lee. (2005). Statistical analysis of geographic information with ArcView GIS and ArcGIS. USA: John Wiley & Sons. Wulder. M. A., K. O. Niemann, T. Nelson. (2004). Comparison of airborne and satellite high resolution data for the identification of individual trees with local maxima filtering. International Journal of Remote Sensing, 25(11), 2225–2232.